In China, PS prices saw their lowest levels of the past year, both in the local and import markets as per the pricing service of ChemOrbis. Lower upstream costs and weaker buying interest were amongst the main reasons behind this decreasing trend since spot styrene costs on FOB Korea basis also sank to yearly lows. 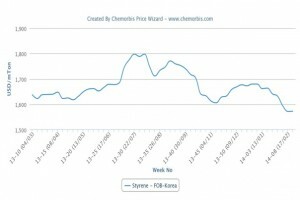 According to ChemOrbis Price Wizard, spot styrene prices hit their highest levels at the beginning of August 2013 for the 52-week period. 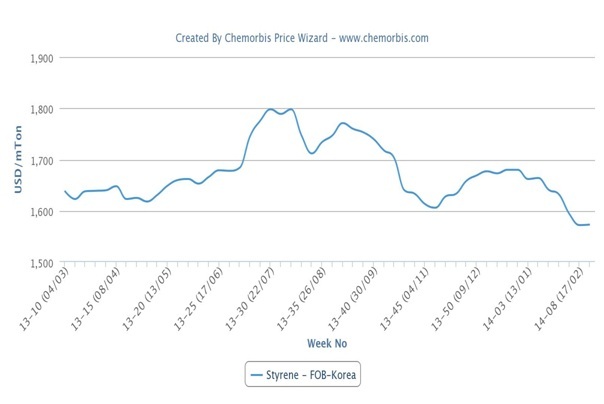 Currently spot styrene prices are around $230/ton lower than that peak level and they are at their lowest level in a year’s time. In China, PS prices lost ground during this past week. Import GPPS prices for both dutiable and non-dutiable origins shed $10-15/ton while HIPS prices recorded larger decreases of $30/ton on the week. Players, pointing to the lower styrene costs, were reluctant about making fresh purchases. A similar panorama was observed in the local marker for A and B grade GPPS and HIPS prices. Local prices lost around CNY100-200/ton ($16-33/ton) on a week over week basis. Overall supplies were reported to be sufficient inside the country but buying interest remained thin. Producers reported lowering their prices in order to speed up their sales.